Greg didn’t know what he was capable of. 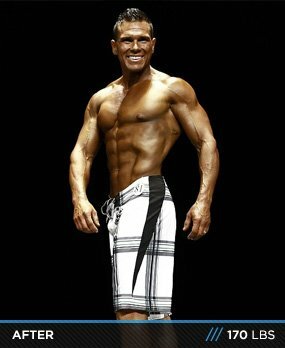 When his wife started competing at fitness shows, something came over him; he realized his potential. Now, Greg owns an IFBB pro card! I used to lift weights to stay busy and feel somewhat in shape, and then I met my wife who has inspired me to get on stage and compete. Her knowledge for the sport is amazing and I would not be the person I am today if it was not for my wife. I see people on BodySpace and admire those who take their bodies to the extremes. There are a lot of people out there that want stage ready bodies, but it's hard work, and a person needs to be very disciplined to win shows. So, for all those people who make it to the stage in 2012, I wish you all the best! My wife was the first person in our family to compete in fitness shows. I saw the work that she had to put in to be stage ready. I always wanted to compete in bodybuilding competitions, but felt I would be too small. Then I heard that there were natural bodybuilding shows. I started training as if I was going to prepare myself for a show. I started to see improvements, so I decided to turn in my registration form and prepare for the show. It is a different feeling training to get in shape and training to get on a stage. That motivated me like no other. Bodybuilding is tough to compete in. It all comes down to a science of carbs, proteins, water, sodium, and training. 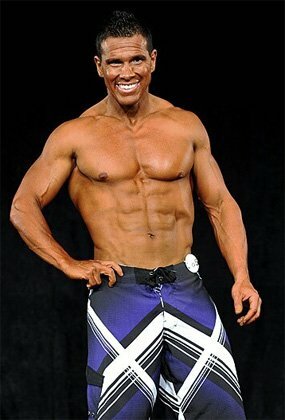 I did okay in my first two natural shows, placing fourth and second. Then I heard about men's physique. 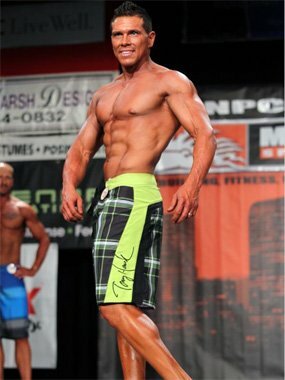 At that time at our gym, one of our members just turned pro in physique. Looking at his body structure, I was not too far off. This drove my desire to compete as a men's physique competitor. Right of that bat, I placed in the top three and won a couple of first place trophies at the local level. At the same time, my wife was doing well as a bikini competitor and she qualified to go to nationals. I joined her and went to nationals with an open mind to place in the top ten. When I got on stage, I was the first call out. A euphoria came over my body, like this can't be happening. The judges move the top five places to the middle. If you know about prejudging at a show, being front and center is the best place to be. I was shocked and my wife and trainer were telling me that I was going to win my pro card. Going to the evening show I had my doubts that it wasn't going to happen, but when they called out my number, 385, as the 40-plus first place finisher and awarded the IFBB pro card, I was in complete shock! Placing the gold statue in front of me was a feeling that all my hard work had paid off. My wife is my rock, my inspiration. Without her this would not be possible. I believe behind every successful man is a strong woman. Earn it! Nothing great is given! I would say the diet in the evening and evening cardio. 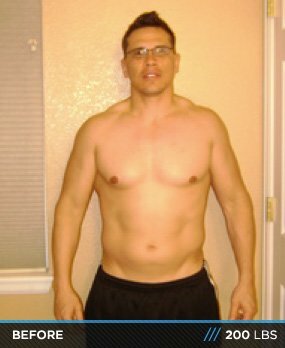 I want to become a pro physique competitor. During the weekend of July 21, my dreams became a reality when I took first in the 40-plus men's physique division, earning my IFBB pro card. No matter how you look at it, you are going to have to do the work. It takes a lot of work, discipline, dedication and desire to transform your body. If it was easy, everyone would be in amazing shape. We live in a society where we are bombarded with unhealthy habits and people need to learn that you only have one body - take care of it as long as you can. Earn it! Nothing great is given. There are a lot of people on the website who have the same desires as you. Sometimes when you're not feeling great, you can go to Bodybuilding.com and find someone to motivate you through their encouraging words.